A single sparkling princess cut diamond is rub over set in an 18ct white gold setting. The diamond is set on an angle so the points go in line with the finger. 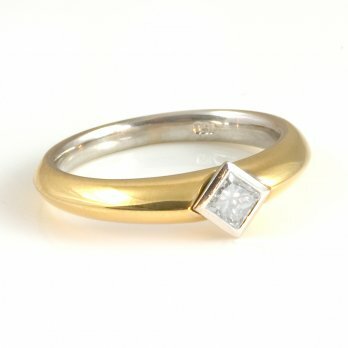 The band is 18ct yellow gold and the shoulders glide under the corners of the diamond to create the band. A modern look just perfect for a modern woman.